a rather unusual chinaman: You having a laugh? Just a brief post here to wish my old mucker the cockroach a happy 31st Birthday. The old man of Sidcup rounded up a few of his massive and after a brief pitstop in the notorious Wong Kei's for a "crispy", we all headed down to the Comedy Store on Oxendon Street. Amongst the motley crew were badger, big Dave, little Dave, the wodge, Northern Will and the Steer. There was also a guest appearance from Bottles at half time but I think we are still debating whether he was actually there or merely a figment of our imagination. The Comedy Store is a bit of an institution. Its been around for over 20 years and is by far and away the premier funny spot in London. It has seen legends such as Robin Williams, Steve Coogan and Eddie Izzard do their thing. Anybody who considers themselves a comedian aspires to tread this stage. 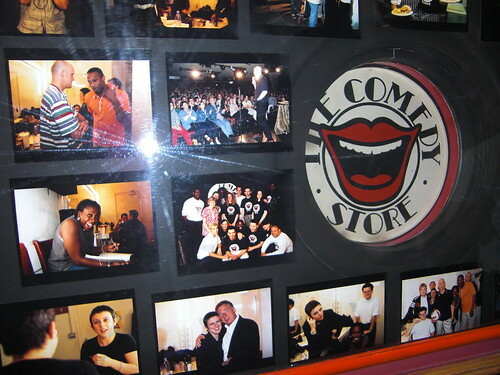 Wednesday night is the "Comedy Store Players", an improvisation night which has been running for as long as the club itself and we were lucky enough to watch Josie Lawrence, Phil Jupitus and Neil Mullarkey amongst others doing what they do best, improvising and making us laugh. Items included an Italian Carry On set in a biscuit factory, Josie Lawrence correctly identifying that she picked the corn off the cob with a harmonica and put them into Tin-Tin tins in a church for an occupation (she's good) and a Roman crime thriller revolving around the theft of a cursed helmet. Really, you cant make this stuff up! Anyway, it was a good night. The lure of late night poker was strong but I am committed to the cause, so off to home I went as I had a long day ahead. Dude I didn't know you had a blog, welcome to the blogging world by the way! Am reading through the backlog now.